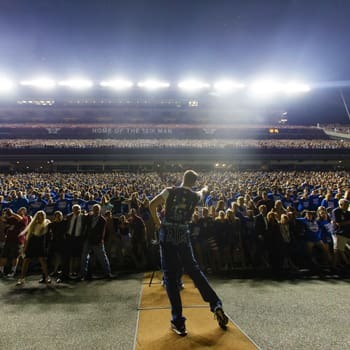 The night before every home game, Aggies hold Midnight Yell at Kyle Field. It is regularly attended by more than 25,000 people. Midnight Yell is also held for every away game, usually at a location in or near the city where Texas A&M will play their opponent. Yell Practice became a regular after-dinner ritual in 1913, but the first Midnight Yell wasn’t held until 1931. It began when a group of cadets was gathered in Peanut Owens’ dorm room in Puryear Hall, when someone suggested that all of the freshmen should meet on the steps of the YMCA Building at midnight to practice yells. The freshman asked the two senior yell leaders at the time to attend. The two said they couldn’t authorize the event, but they just might happen to show up. Word about the midnight gathering quickly spread, and that evening, Midnight Yell was born. When Owens became a yell leader, it became a tradition to walk back and forth. This was because Owens’ feet were too big to fit on the steps of the YMCA Building, the original location of Midnight Yell, so he paced in order to keep his balance — and the other yell leaders joined in. Midnight Yell begins when the yell leaders lead the Fightin’ Texas Aggie Band and current and former students into the stadium. Once there, the yell leaders lead the crowd in yells dating back to the earliest days of Texas A&M. The crowd will sing The Aggie War Hymn and listen to fables from the yell leaders, telling how the Aggies are going to beat their opponent on the field the next day. A recent addition to Midnight Yell is called First Yell. The yell leaders started First Yell in 1999 as a way of welcoming all Aggies, including both current and former students, back to campus to begin a new school year. First Yell occurs on the weekend of the first home football game and includes performances from student, local and nationally known entertainers. Midnight Yell is one of my favorite Aggie traditions. It is a fun way for the student body to get excited for the upcoming game. I enjoy listening to the yell leaders and observing all the Corps’ traditions. What other university can convince 30,000 people to meet at the football stadium at midnight to practice yells for the next day’s football game? None. It’s a sight to behold.